Captain Mitch Nelson (Chris Hemsworth) is enjoying quiet moments at home with his wife (Elsa Pataky) and tiny daughter Maddy (Marie Wagenman) when they look up at the television and see the horrific events of 9/11, as planes crash into the twin towers of the World Trade Center in New York City. 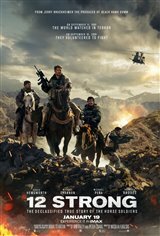 Although he was about to be assigned to a desk, Mitch immediately goes to headquarters and begs to be allowed to lead his elite U.S. Special Forces team of Green Berets into Afghanistan to begin the crusade against the terrorist group responsible, which has taken over the city of Mazar-i-Sharif. Although he's given six weeks to complete the task, Mitch vows to do it in three weeks with the help of Chief Warrant Officer Hal Spencer (Michael Shannon). However, when their ally, Afghan General Dostum (Navid Negahban), tells Mitch he can only take six of the 12 men and only on horseback, it's just the first of the setbacks the men face in taking down the violent Taliban. Based on the book Horse Soldiers by Doug Stanton.